Why do YOU love East of Eden? – my books. my life. Why do YOU love East of Eden? As most of you know (because I may have screamed it from the rooftops), I finally finished East of Eden in June after starting it waaaaaaaaay back in January. It isn’t that I didn’t like the book. In fact, I thought it was beautifully written and contained thoughtful insights. But I just couldn’t get through it. Eventually, Jen from Devourer of Books had to badger me into reading a chapter each day via twitter. That’s what it came to. I don’t want to write a review because, honestly, I’m not really sure how to do that. And while I thought East of Eden was a very good book, I did not fall in love with it like many peopledo. So I want to know why you, the East of Eden lovers, adore this novel as much as you do. I am in total agreement with you no matter how great a book is, if I don’t like it for whatever reason, I won’t review it. I’m with you on this one. I liked the book, but didn’t love it. 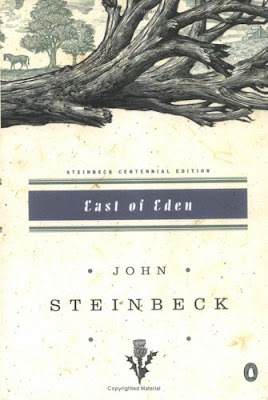 I do love some of Steinbeck’s other books (Travels With Charley and Cannery Row) but I just hated the majority of the characters in East of Eden, so it was hard to care about them. It’s been ages since I read East of Eden but it is one of my favorites. My sister read it and felt more like you guys did. In fact, I am not sure she even got through it. I think I have a thing for emotionally damaged young men who have parental issues. LOL. But I think now I am inspired to re-read it so I have a better reason. I saw on She Is Too Fond Of Books that you were in GSP – if you ever come back, let me know, so we can get together! I thought of you when I was there but I was actually headed to Asheville. Is GSP near you? Im reading this next month so it was interesting to see other opinions, this will be my first Steinbeck book. I loved East of Eden for the prose and Cathy’s awesome villainy. However, I didn’t fall in love with it completely and I do think The Grapes of Wrath is a far superior book. Plus, it’s much faster to read (ie I read it in 3 day as opposed to 3 months like with EoE). Totally loved the book. But it is one of the very few books of which I prefer the cinema adaptation. Unforgettable. Ciao. A. Loved East of Eden. It’s been a long time but the characters really stayed with me for a long time. I agree that the movie was an excellent adaptation. I haven’t read this but I just wanted to say that I am so happy for you that you finally finished it. And also, that I like the idea of twitter being such a help in supporting people while reading a difficult book. I love East of Eden because I am astounded at the magnificent writing in it. The book takes the reader through a journey of generations. Although others may disagree, I feel as though the whole book revolves around Cathy, the wicked mother who is a monster. I simply do not understand how someone could not get through this book, even though I understand you not loving it. I do not love the story but still count it as one of my favorite books because of the great descriptions, character development, journey through the ages, and depth that presents evil and innocence in a new way. I have been wanting to read east of eden for a while. Ever since I listened to the song East of Eden, by Zella Day, I have wondered what ‘East of Eden’ was about. I looked up the biblical story behind it, and then stumbled on the book. I read the summary, and became obsessed with it. It sounded like an extremely fascinating story that captures jealousy and love and hatred and evil and well everything. Every emotion. I can’t wait to get it from the library. P.S. Sorry if my comment is too deep. I am not sure why I got extremely obsessed with the plot.